Top Texas Republicans continue to court Robbie Cooper, the owner and writer of a racist Texas-based blog called Urban Grounds. 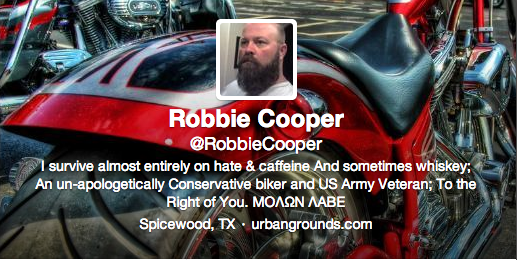 As BOR reported last week, Cooper writes deeply racist posts in which he calls black people “animals” and the N-word. “Lt. Gov. Dewhurst was very generous with his time – he sat and listened and answered questions from our small group for a couple of hours…I asked Dewhurst what work is still left to be done for him in his current job – what would he like to accomplish that he hasn&apos;t already done in 10 years. He talked about our economic and financial successes here in Texas (for which he doesn&apos;t get nearly enough credit, and Governor Perry perhaps gets too much credit), and said that there is still a lot of work to be done just to maintain that economic prosperity; we can&apos;t rest on our laurels or past accomplishments,” Cooper wrote. Disturbingly, Dewhurst is joined by both Greg Abbott and Rick Perry in courting Cooper&apos;s favor. In January, Abbott gave Cooper a 20-minute exclusive interview, and has thanked him for his support on Twitter. Rick Perry took Cooper and a small number of other conservatives shooting in 2010. Why are Texas&apos; top Republicans openly courting a racist blog? Read more below the jump.Every time Abbott, Dewhurst and Perry give Cooper special access, they legitimize the racist views he promotes. They don&apos;t belong anywhere near the public discourse, and Cooper doesn&apos;t belong anywhere near Texas&apos; leaders. In addition to using the N-word, Cooper has said black culture has “no respect or appreciation for the private property of others” and that “[e]very single thing they own or posses was either given to them or stolen from others”. He also promotes political violence, saying to the “Leftist Media” that “some of us will bring ropes to your offices” during the “revolution”. Do Abbott, Dewhurst and Perry agree with Cooper&apos;s views? Why do they think it&apos;s okay to openly court the owner and writer of a racist blog? Will they renounce Cooper?